LRpro - the FIRST pitch control with sensitivity adjustment from your transmitter! Right: Sensitivity is not adjusted by a switch on the controller itself but via a proportional channel of your transmitter. After having established optimal sensitivity of pitch control the second wire lead can be removed from the receiver leaving this channel vacant for other uses. 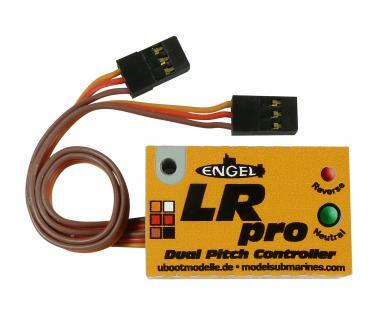 The LRpro offers two servo outputs so that on models with dive planes at aft and bow both plane pairs can be combined. As soon as the motor (brushed) draws more than 2V in reverse pitch control also reverts the servo signal, meaning that the LRpro will keep the model in its horizontal position even in backward motion. This mode is also indicated by a red LED on-board of the LRpro. Please note: Integrated pitch reverse is only functional in combination with a brushed motor. 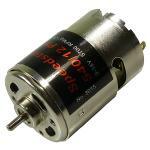 If a brushless motor is used as main drive optional Reverse Drive Detection BL (item no. 8454 or 8455, with and w/o BEC) is required. The LRpro can be mounted in any position at any angle. Just bring planes to neutral and press button - pitch control is now brought to neutral. Depending on submarine and installation of servo(s) it might become necessary to invert a servo. For changing direction of servo rotation just press the neutral button and power-up receiver. The servo connected as servo 2 will then rotate inversely. Repeat this procedure to change rotation back to default setting. 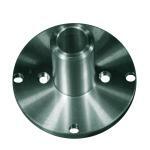 The LRpro allows reduction of servo movement (throw) down to 50%. Adjustment is made simply by pressing the Neutral button. The actual reduction is indicated by flashing frequencies in groups of three of the red LED. Reduction is possible from 100% (full movement) to 50% servo movement. This is done fully electronically and adjustment can be changed easily any time. The more the transmitter stick is moved in either direction, the higher the level of manual control. At about 70% stick movement (depending on transmitter) pitch control is almost inactive. Transmitter signal is then passed on directly to the servo(s). This ensures that full manual control can be retrieved if required or desired in any situation without having to search for an "off" button. 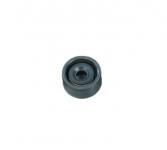 All this is packed in a sturdy casing allowing easy and safe installation. Current consumption: 6.1 mA (forward) to 8.4 V (reverse) at 5 V receiver battery voltage. 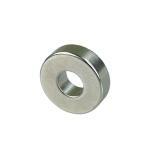 Power Magnet Cube 3x3 mm, 2 pcs.